After a series of boring flashback stories I am back to haunt this space. The past few days have been spent in religious fervor as the whole country celebrated the birth of the elephant god. Headquartered in Mumbai with major branches all over the country, my favorite tusker friend’s pandals adorned the bylanes of every street. While he is being fed modaks and a host of sweets we feel content if we even manage to catch a glimpse of him. I have been trying to get him to do an exclusive for this space but in vain. However today as he begins to leave the gullies and return to his heavenly abode, I managed to grab him for a few minutes. I’ve always wondered how Ravana would have felt if his ten heads ached. Similarly I’ve always wanted to hear an elephant with a running nose, just imagine what a scene that would be. As I was on my way to meet my Ganesha i could hear thunderous implosions which I mistook for the LHC(Vaigyanaik daanav according to the news channels) gone wrong. Turns out that it was just my friend G-money sneezing and boy was he sneezing! BB: Hey G, you okay? we can do this later if you want! G: aaaaaaaaaaachoooooooooooooooooo. Sorry my man, its just the water. The water these days I tell you, so bad Baba. Wonder what these guys are dumping in to it these days, totally messes up my immunity system. You seem to be doing well though, it doesn’t affect you guys huh? Damn these bhaktas, they immersed me in water that had so many unmentionable things floating. How can you guys dump me in the water like that? BB: Aww G-money the water didn’t suit you eh? Our bodies have got used to it, only out-of-towners like you have problems. How were the festivities? You seemed to have enjoyed the pomp and color! G: Oh yea don’t get me started on that, I wasn’t fed anything though few people ate a lot of currency in my name. There were huge pandals and long lines which I never asked for in the first place. Prasadam was prepared in gigantic proportions and the donations kept pouring in. There were movie songs blaring in the huge speakers and local singers cavorting with the raagas. There we huge posters, banners and contests that some pandals ran as publicity drives. Local businessmen bid for rights to sponsor everyday festivities. I seem to be turning into a very profitable proposition, you must help me turn it into a franchise. Baba, imagine the avenues we could open if we monetize it. BB: Gosh G, no wonder you have Siddhi and Buddhi as your consorts. Tell me about the women, they must have turned up in large numbers and all decked up right? G: Ah Baba, Don’t even get me started. There were guys who’d turn up at the pandals just for the women. I was under the impressions that I was the main draw, but the guys were least interested in me. Many young hearts used my pandals as meeting places, I guess they were banking one me to remove all obstacles in their path! The kids came for the prasadams and the married women came for bragging rights and gossip stories.You know what, if I’m not wrong that davinci guy even made a post on this type of bhakti. I wonder if anyone ever comes to see me, for each of them seem to have an agenda of their own. BB: Tell you what G, you are the most artist friendly deity of em’ all. Must have been fun to see the various shapes and sizes of your idols. G: Shapes and sizes? Baba my man you forgot to mention the things people used to make my idols. Some guy used coconut shells, another used dry fruits and nuts. In the past they’ve used ice, jaggery, broken bottles and probably anything you can think of. Now that you mention my idols, we sure must talk about the creativity behind them. I never knew that I was deported to Iraq, however one pandal had me sitting on a tank, another had me crushing a terrorist under my feet. I’ve been flanked by prime ministers, cricketers and even film personalities in the past. A pandal was shaped like a pyramid however Cleopatra was missing by my side, but I sure love these uber-creative pandals. BB: Cleopatra eh? you naughty! You seem to be hogging all the news with those gigantic idols. Last heard it was 45ft right? G: Oh yes record breaking tall idols that don’t drown and have to be broken with hammers so that the water engulfs them. I feel bad for all this Baba, there is no bhatki attached to it anywhere. You must have heard that the loudest seller sells all his wares. It’s a similar story with larger idols attracting all the media attention and thus drawing more bhaktas. More bhaktas ensures more visibility for the pandal sponsors who also setup stalls and have volunteers wear their t-shirts. I’m have no objection as long as everyone is happy and makes some money in the process, but what angers me is the treatment dished out on the visarjan day. Huge idols are kicked, broken so that they submerge, is this right my friend? You invite me with all pomp and gaiety but then break me or throw me into the water when you’re done. BB: You pessimistic pachyderm, why do you have to find fault in everything we do? Look at the unity and how people come together. G: You make a valid point Baba, pandals were organized for a purpose. That dude B.G.Tilak started them to deliver rhetoric speeches and garner unity in the pre-independence days. That spirit somehow seems to be lost now, don’t you agree? Pandals now only serve the purposes of local sponsors, news channels and fund college fees for the children of the organizers. Well but if my homecoming brings unity and peace to the community then I’d rather not mind being stamped upon. Broken pieces of me will keep floating in the water fro a few days, the aqua life and other eco-systems will be handicapped but then you guys are happy. Humans I say! BB: C’mon G-money, be a sport. Go back to your momma as we prepare to invite her next month. See ya next year buddy. PS: This post started out differently, but Kar beat me to it. I didn’t wanna delete the draft so changed it. Spare me if it seems weird. well written !!! but invite momma next month ? i thot that was over ..
Weird? Naah! I’d say yours was more message oriented, more for the common good than my self-centered ramble! Bravo! Agree with all of Big G’s gripes! He needs to be treated with more respect you see, after all he makes life easier for us. Don’t we share a responsibility of making Him feel at home when He visits us? Poor G! Waah nice nice! Everybody loves G. But sometimes people take too much liberty in making the idols! me: ppl have the creative license only with Mr.G. I guess it is the love they have for him that makes them visualize him in various forms. Also nobody would come to the pandals if all ganesha’s looked the same. I agree with G-money. Humans I say! I didn’t think G-money would want Cleopatra by is side. O ris he getting bored of his lifestyle? me: who wouldn’t want Cleopatra by his side? Mr.G is known as ‘ashtasiddhi’ not just like that! I could get used to that image! me: remm the story of 4 blind men and an elephant? We are like that so each of us has an image that we like. The sama analogy holds for god as the elephant and the 4 big religions as the blind men. 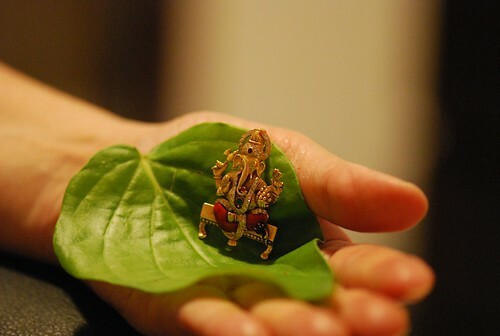 This is a beautiful imaginary interview with Ganesha to bring out the reality behind the festival. I liked it! and you had to compare Ganesha’s trunk with LHC … he he ! me: thank u dinesh saar I’m glad you liked it. Kya kare the LHC is all the news channels wanna talk abt! Hehe. Read it finally 😛 Baba Bengali is very influential eh? The remover of obstacles- My obesiance always is at His altar first. Mr BB and the Owl could be brothers-cheeky fellas them! Haha. Good take on a popular God. Poor guy, didn’t know he went through so much trouble every year. Romba paavam thaan. Btw.. it’s been a while since I saw a proper Ganesha pandal, but I had no idea corporate sponsors were in this market too. enna neengal ipdi tellin? Khairatabad ka ganesh bhool gaye kya? I was too busy with the local ganesha as long as I was in Hyd. So Khairatabad Ganesha pathi only heard. Besides Hyd poi 11 yrs aidthu.. so dont know if all this used to happen back then.